Obama Eases Sanctions On Sudan – Lifeline For Bashir Or Catalyst For Change? 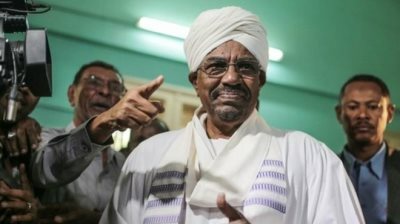 Omar Al Bashir is trying to turn Sudan into an Arab country by wiping out its African population. AFRICANGLOBE – What’s behind Obama’s 11th-hour decision to lift sanctions on one of the world’s most isolated regimes? In one of his final acts in office, US President Barack Obama announced last Friday the partial lifting of sanctions against Sudan, paving the way for normalisation of ties with one of the most isolated countries in the world. Obama’s decision has drawn sharp criticism from within the US, the only country in the world that officially labelled mass killings in Darfur as genocide. Human rights organisations and long-time anti-Khartoum activists rushed to condemn the decree, calling it “inexplicable,” “premature” and “a deal with the devil”. Some argued that Obama had forfeited America’s biggest bargaining chip over President Omar al-Bashir, while others vowed to “work with the U.S. Congress to see some of these sanctions restored”. The view from Sudan, however, appears markedly different. In dozens of conversations with the author over the past months, Sudanese from all walks of life and from across the political spectrum overwhelmingly described the sanctions as unjust and counterproductive. Even the fiercest political opponents of Bashir voiced support for sanctions relief, not because they doubted their government’s guilt in perpetrating human rights abuses, but because the sanctions have done little to bring about change on the ground. Despite there being sanctions in place for the majority of his rule, Bashir remains in power after 27 years, with no signs of political opening. The sanctions didn’t limit the elite’s ability to amass wealth, nor to get their hands on weapons. Moreover, average citizens bore the brunt of the trade embargo. This view, grounded in practical rather than moral considerations, is one that seems to have prevailed in the final year of the Obama administration. However, the importance of geopolitical factors in the recent decision cannot be understated. Sudan is seen as a stabilising force in an increasingly volatile neighbourhood. Sudan is also working with the West to tackle irregular migration and terrorism in the region. Obama’s 11th-hour decision may also reflect a realisation that a more constructive approach was needed to move forward, that Khartoum needed less stick and more carrot. The easing of sanctions is not so much a reward for steps taken by the government, but more of a goodwill gesture intended to catalyse future change. What has been lifted, what remains? Obama’s partial easing of sanctions was the product of a discreet, bilateral deal struck in June last year. Khartoum declared a unilateral cessation of hostilities in the South Kordofan and Blue Nile states on the border with South Sudan, promised to allow humanitarian access and at least officially withdrew support to South Sudan’s rebels. The US also claims that the government has halted aerial bombardments in Darfur and the two border states. In return, Obama revoked the trade embargo imposed in 1997 for Sudan’s perceived support for terrorist organisations, unfroze assets of Sudanese government officials, and waived laws that prohibit US foreign assistance to Sudan and that block the country’s access to financing through Institutional Financial Institutions. The order is effective 12 July 2017, with key provisions subject to confirmation by the incoming Trump administration. But a general license authorising all trade with Sudan introduced by the Treasury at the same time provides immediate sanction relief. Some sanctions remain intact, however, including those imposed in 2006 against a handful of individuals thought to be responsible for the genocide in Darfur. Sudan also retains its spot on the list of state sponsors of terrorists, a designation that even the US agrees is baseless today, but that can only be lifted with congressional approval. So what impact is Obama’s executive order likely to have? Will it help bring in Sudan from the cold, or will it reinforce the regime’s bad behaviours? Sudan’s economy, which has been hit particularly hard by the loss of oil revenues to South Sudan and the global decline in global oil prices, could get a much needed respite from the easing of US sanctions. The lifting of the embargo could attract investment, jumpstart private sector development, and stabilise the weakening Sudanese Pound. Other countries that had chosen to stay away to protect their US business interests are also likely to resume trade. The ability to trade openly with the West should increase competition, reduce the monopoly of the state over the economy, and drive down prices of consumer goods by cutting out intermediaries who have benefited from the sanctions by unofficially trading in foreign goods while charging hefty margins. Ordinary Sudanese, who are least equipped to absorb the financial impact of the sanctions or find loopholes, would stand to gain most. The stabilisation of the economy could further stop the exodus of the educated middle class, arguably an important driving force for democratisation. The prospect of economic growth and global integration might also give disenfranchised youth hope, and weaken the appeal of armed rebel groups and international terrorist organisations that have recruited in Sudan in the past. On the regional level, the easing of financial sanctions would also lead to Sudan’s re-integration into the formal financial system, bolstering US efforts to monitor terrorist financing and money laundering. While Khartoum seems to have taken some steps towards the de-escalation of conflicts as part of its deal with Washington, it hasn’t allowed for meaningful political opening. A recently concluded national dialogue was widely seen as window dressing, with major opposition parties boycotting the process. Furthermore, in the months leading up to Obama’s announcement, security forces rounded up dozens of opposition members and confiscated editions of several independent newspapers. Just three days after Obama lifted sanctions, security forces reportedly prevented members of the opposition from travelling to Paris. Sanctions relief in this political climate could be a double-edged sword. On one hand, Obama’s move may give some breathing space to a ruling party at a time that it’s feeling the pinch from a burgeoning civil dissent movement. By boosting the ailing economy, often regarded as the regime’s Achilles heel, the easing of the trade embargo could take the wind out of the sails of activists who have been calling for reform. But, on the other hand, it could also empower civil society organisations by opening up previously blocked opportunities for education, travel and access to technological tools – things that remained elusive despite recently granted licenses. Finally, there’s the question of regime change. It’s arguable whether this was ever the goal of US sanctions. But in the wake of the Arab spring and with ISIS controlling territories across Sudan’s porous borders with Libya, Washington’s rapprochement could be a signal it may be settling for a stable if objectionable regime. Sudan’s opposition, disjointed and lacking trust among the Sudanese, doesn’t present a compelling alternative at the moment. There may be ways, however, to influence a desirable political transformation in Sudan. Over the past years, the ruling party has grappled with infighting and a succession crisis. President Bashir, who reportedly only ran in the 2015 election because his party couldn’t agree on a replacement, is likely to step down in the next couple of years (provided he trusts he won’t be extradited to the ICC). Washington’s decision to engage more closely at this delicate time could be an opportunity to bolster moderates and steer Sudan towards a gradual opening. Obama’s executive order presents an important step towards a new chapter in US-Sudan relations. But to what extent change will be realised remains uncertain. Trade will only take off if the international banking system feels confident enough to relax its de-risking policies towards Sudan. As long as Sudan remains on the list of state sponsors of terrorism, banks may not see the recent policy shifts as a strong enough signal to reengage with Sudan. More importantly, the permanent revocation of the trade embargo will need to be confirmed by the new administration before 12 July 2017. Depending on how strongly Donald Trump disagrees with Obama’s policy, the president-elect could also rescind the general license issued by the Treasury. Trump and his nominee for secretary of state, former ExxonMobile CEO Rex Tillerson, have yet to make clear the new administration’s position on Sudan. It’s likely to be the result of a tug of war between Christian and human rights lobbies, who will likely pressure Trump to reverse Obama’s reconciliatory move, and the administration’s economic interest, not least in the oil sector. Much will also depend on whether the government of Sudan will seize this opportunity to start a new chapter, stick to its promises and start making genuine efforts to bring about reform. Previous articleMilitary Invasion Imminent As West African Leaders Prepare To Remove Yahya Jammeh?